When Spanish explorers reached South America in the early 16th century, they heard stories about a tribe of natives high in the Andes mountains in what is now Colombia. When a new chieftain rose to power, his rule began with a ceremony at Lake Guatavita. Accounts of the ceremony vary, but they consistently say the new ruler was covered with gold dust, and that gold and precious jewels were thrown into the lake to appease a god that lived underwater. The Spaniards started calling this golden chief El Dorado, "the gilded one." The ceremony of the gilded man supposedly ended in the late 15th century when El Dorado and his subjects were conquered by another tribe. But the Spaniards and other Europeans had found so much gold among the natives along the continent's northern coast that they believed there had to be a place of great wealth somewhere in the interior. 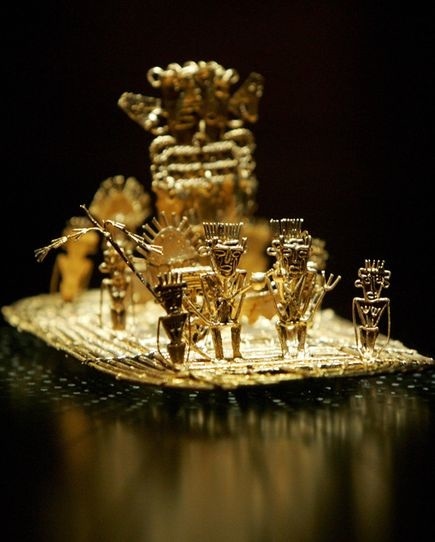 Pictured: an ancient artwork in the Gold Museum of Bogota, Columbia, showing the origin of the El Dorado myth. Photograph by Mauricio Duenas/AFP/Getty Images.